Each session offers different classes & teachers, so you can attend one or both together! Tuition Fee is $260 for one week or $480 for both (save $40!). Included in your tuition is a tee shirt, ticket to see that week’s IMPACT show and the Wednesday matinee performance of Rodgers & Hammerstein’s Cinderella. We also have discounts for families with 2 or more children who want to attend. Jean’s Playhouse, PO Box 1060, Lincoln, NH 03251. Registration: Broadway Bound Registration Form and Liability Release. 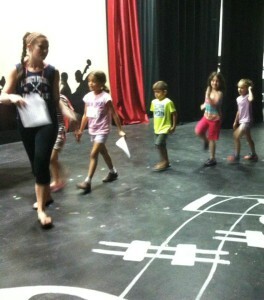 Broadway Bound is a unique and memorable day camp experience that puts your son/daughter on the stage instead of in the audience! Taught by professional main stage actors from all over the country, Broadway Bound offers a variety of fun and engaging courses that will have your kids singing and dancing! 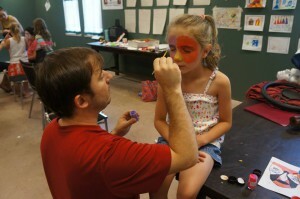 Themes of the day camp change from year to year, but courses typically include improvisation, arts and crafts, singing, dancing, acting, theatre games, and more. All the courses are designed to be fun and contribute to creating the final performance. The camp wraps up with a grand finale that showcases the new skills your kids have learned. Pack the house with friends and family as your kids sing and dance their way across the big Jean’s Playhouse stage. Please call the Business Office at (603) 745-6032 or e-mail jmercier@jeansplayhouse.com with any questions. THANK YOU to our 2019 Broadway Bound Sponsor, the Lincoln-Woodstock Rotary Club!